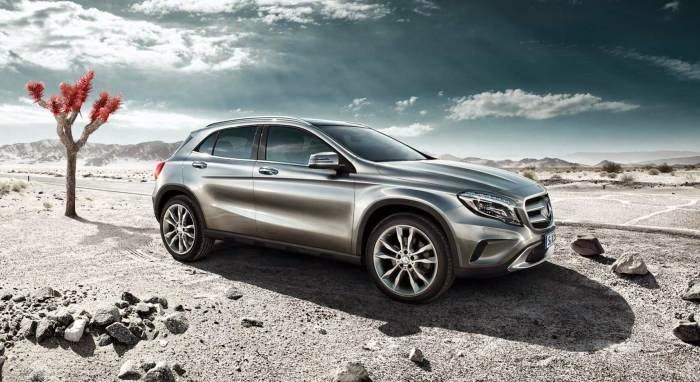 The Sexiest SUV by Mercedes The new GLA. ..Always restless. For seekers and the curious, Those who want to discover something new each day .It is for those who don't see distance as an obstacle but as an enrichment .Finally it is for those people who loves driving and off-roading. Urban sportiness and rugged off-road elements team up in an SUV which is at home all over the world. According to Mercedes , it is the design of the new GLA impressively demonstrates just what the S in SUV stands for. Sportiness – from every perspective. its progressive character is rounded off with classic SUV styling elements. The fitted roof rails, the simulated under ride guard and the black, grained elements lend this exceptional SUV an athletic appearance. What's more, the matt MAGNO paint finish makes the GLA even more of a trendsetter. The interior also carries forward the sporty appearance: the integral seats ensure not only agile spaciousness, but also hold vehicle occupants firmly in place in all situations. And with such a rousing vehicle design, this is definitely a good idea. Watch this video for enjoying the features of GLA . 4MATIC all-wheel drive with off-road functionality, the driver remains in full control even when driving off the beaten track. And let's not forget about keeping the driver informed – the head unit shows important off-road information such as the climb and incline angles of the vehicle. Even the wind can't keep up: the GLA with its Cd value of 0.29 is the most streamlined SUV on the market. The EASY-PACK tailgate can be opened easily by means of a single press of the radio remote control. In addition to this, the load compartment package with adjustable rear seat backrest angle and two-section split tail lamps offers an increased load compartment capacity whilst simultaneously ensuring comfortable loading and unloading. Not only luggage can be stowed away without problem in the GLA. Even the sun finds its place in the vehicle thanks to the large sliding sunroof. A further highlight in the vehicle interior comes in the form of COMAND Online which brings Internet into the vehicle on the CENTRAL MEDIA DISPLAY. Alongside which, Bluetooth and USB ensure optimal connectivity. Using the Drive Kit Plus, music from an iPhone® can be displayed and selected directly. For that very reason, the new GLA is equipped with COLLISION PREVENTION ASSIST. It optically warns the driver when the preselected safe distance to a vehicle in front is no longer being maintained. If there is a risk of collision, an acoustic warning tone will additionally be activated. If the driver depresses the brakes at this stage, Adaptive Brake Assist can help with the braking manoeuvre: it provides the driver with exactly the right amount of braking power for the situation. Accidents can thus be avoided. But the GLA doesn't just detect potential dangers on the road. ATTENTION ASSISTanalyses the driver's behaviour and if driver fatigue is detected, it will inform the driver to: "Take a break!" After taking a break, the journey can safely be continued.